Today is Arbor Day, a holiday that celebrates the importance of trees. As such, it seems appropriate to talk about the role deforestation plays in global climate change. According to the World Wildlife Federation, deforestation and forest degradation account for 15% of global anthropogenic carbon dioxide (CO2) emissions. That makes it the second largest human-generated source of carbon dioxide in the atmosphere, behind only the burning of fossil fuels. Forests are often called the “lungs” of our planet, as trees absorb CO2 and release oxygen as part of the process of photosynthesis. As such, forests act as carbon sinks. When cut down, the trees not only stop absorbing CO2, but they release it when they are burned or left to decompose. The WWF says we lose forests around the globe at the rate of 36 football fields every minute. Deforestation is the large scale clearing of forests for other land uses. Its biggest drivers are agriculture and logging. In the tropics, where trees grow year round, forests are often cleared to make way for monoculture farms of palm oil or soybeans. While these crops also absorb CO2, it is far less than the amount absorbed and stored by native forests. Deforestation also has localized climate impacts. Without trees to evaporate ground water and release it as water vapor though the process of transpiration, local climates tend to get drier. When it does rain, runoff increases and accelerates the rate of soil erosion. Deforestation also means a loss of habitat for numerous species of plants and animals, which lends itself to a decrease in biodiversity. Recognizing the scale at which deforestation is impacting global climate change, policymakers at the UN adopted a set of policies known as REDD (Reducing Emissions from Deforestation and Forest Degradation). They offer monetary incentives to governments in developing nations to maintain and manage their forests more sustainably. In facing the challenges of climate change, mitigation efforts are needed on all fronts. Everyday is Earth Day, as the saying goes. Today, however, marks the official celebration. 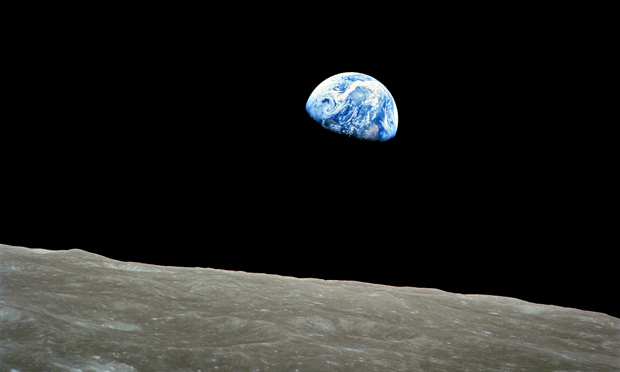 The first Earth Day – spearheaded by Senator Gaylord Nelson of Wisconsin – was held on April 22, 1970. An estimated 20 million people attended rallies across the country to protest against rampant industrial pollution and the deterioration of the nation’s natural environment. Raising public awareness and shifting the political tide, these events helped put environmental issues on the national agenda. They lead to the creation of the EPA and the passage of the Clean Air Act, Clean Water Act, and the Endangered Species Act. Today, forty-five years after the original, Earth Day is celebrated in 192 countries across the globe. Some communities have even expanded the celebration into Earth Week. These continuing efforts to raise environmental awareness are more important than ever as we face the challenges of Climate Change. Our global temperature continued to rise last month. In fact, March 2015 was the warmest March ever recorded for the entire planet. For those living in the northeastern United States, this news may come as a bit of surprise. Many cities in the region, including New York City, experienced an unusually cold and snowy March this year. This difference in local and global conditions, however, highlights the fact that climate change is a complex phenomenon that involves much more than what is happening in our own backyards. Year to date, the first quarter of 2015 (January, February, and March) was the warmest of any year on record. Global temperature records date back to 1880. 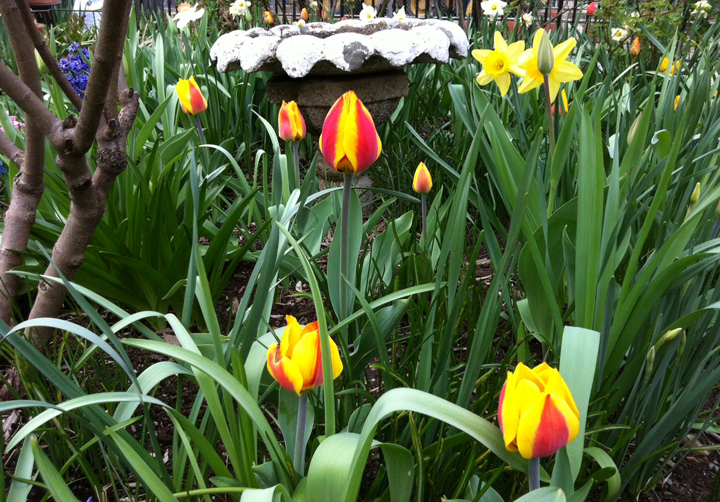 After a cold and snowy winter, birds are chirping and flowers are starting to bloom in New York City. More than three weeks after the vernal equinox, spring has finally sprung! With a high temperature of 72°F in Central Park, today was the warmest day the city has seen all year. It has not been this warm in the Big Apple since October. Our normal high for this time of year is 61°F. A tornado outbreak barreled across the mid-west on Thursday night. The strongest of these twisters caused widespread destruction, two deaths, and at least twenty injuries in the neighboring towns of Fairdale and Rochelle in northern Illinois. The National Weather Service has given the deadly tornado a preliminary rating of EF-4, the second highest ranking on the Enhanced Fujita Scale. Measuring a half-mile wide with winds near 200mph, the wedge shaped twister is reported to have traveled nearly thirty miles on the ground. Local officials in Fairdale say the storm affected every home in the community with eighteen swept completely off their foundations. The tornado also destroyed many trees and power lines across the area and even toppled a tractor-trailer on Interstate-39. Tornadoes of this intensity are not that common in northern Illinois. 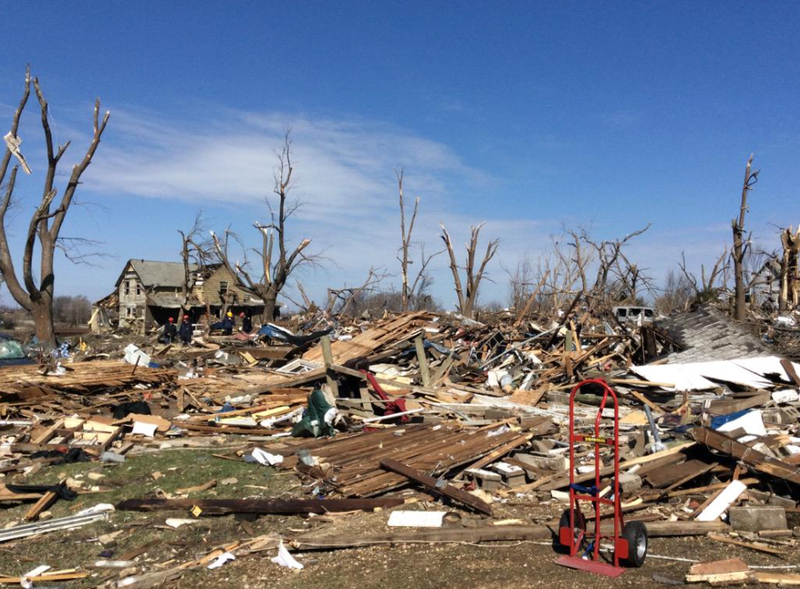 The NWS says Thursday’s storm was the strongest tornado on record (since 1950) for the two counties where Fairdale and Rochelle are located – DeKalb County and Ogle County, respectively. Year to date, tornado season – which typically begins to ramp up in March – has been fairly quiet. But, as this latest storm shows, it only takes one tornado to devastate a community. Tornado Damage. Image Credit: Rockford Fire Dept. Easter and Christmas are major holidays associated with the beginning of two different seasons – spring and winter, respectively. Nonetheless, the weather conditions for their most recent occurrences in New York City were oddly similar. The high temperature in Central Park yesterday, Easter Sunday, was 61°F and the low was 42°F. Back on Christmas Day, December 25th, the high was 62°F and the low was 44°F, tying the record for the city’s third warmest Christmas. Conditions this Easter were only slightly above average for the date. The warmest Easter on record for NYC, according to the local National Weather Service office, was in 1976 when the high temperature reached 96°F. The coldest was in 1940 when the high was only 31°F. In response to the multi-year drought that has been plaguing California, Governor Jerry Brown issued an executive order on Wednesday that requires water usage across the state to be reduced by 25%. 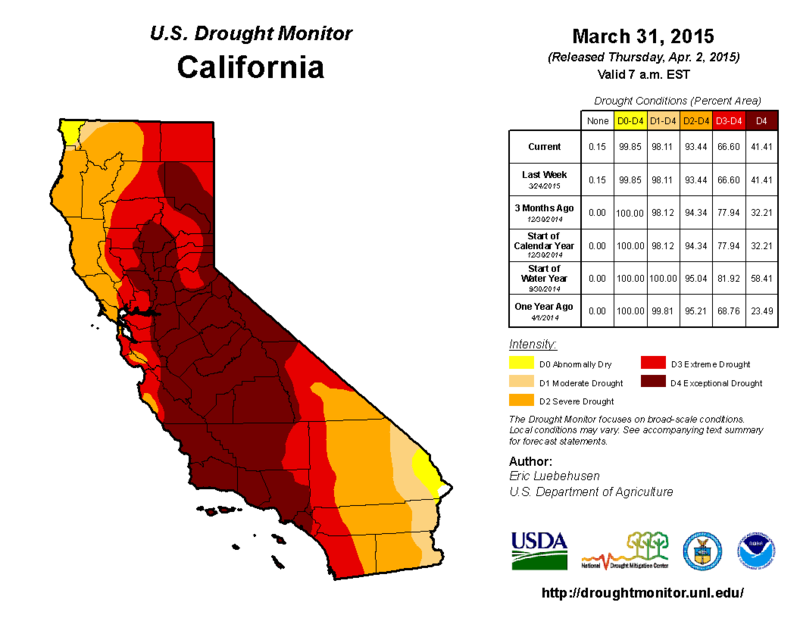 This is the first time statewide mandatory water restrictions have been enacted in California. Standing on a dry patch of land in the Sierra Nevada Mountains that is normally covered with five feet of snow at this time of year, the governor said, “We are in a historic drought and that demands unprecedented action.” Last year, the state declared a drought emergency and asked residents to voluntarily reduce their water usage by 20%. This year, the reductions are compulsory and will be enforced with hefty fines for those who do not comply. Statewide, according to the California Cooperative Snow Survey Program, the Sierra Snowpack is about 5% of normal for the date. Acting like a savings account, the snowpack is a critical part of the state’s water supply. They store water from the wet winter season and slowly release it to rivers and reservoirs as they melt in the spring and summer. The current California drought – now in its fourth year – is considered the worst drought on record in the state since 1895. Scientists who study historical climate proxies, such as tree-rings, say this drought is possibly the worst the region has seen in 1000 years. California is no stranger to drought, but experts say warming conditions related to climate change are making this event worse than it would be otherwise. Once drought takes hold of a region, it tends to feed on itself in a vicious cycle. To start, high temperatures increase evaporation rates causing the soil to dry out. Without plentiful rain to replace the moisture, the sun’s energy heats the ground and the air even further making the affected area even drier. California, according to NOAA, just had its warmest winter on record. The previous record was set only last year. Local water agencies across the state will be responsible for implementing the cutbacks required by the governor’s executive order and for monitoring compliance. 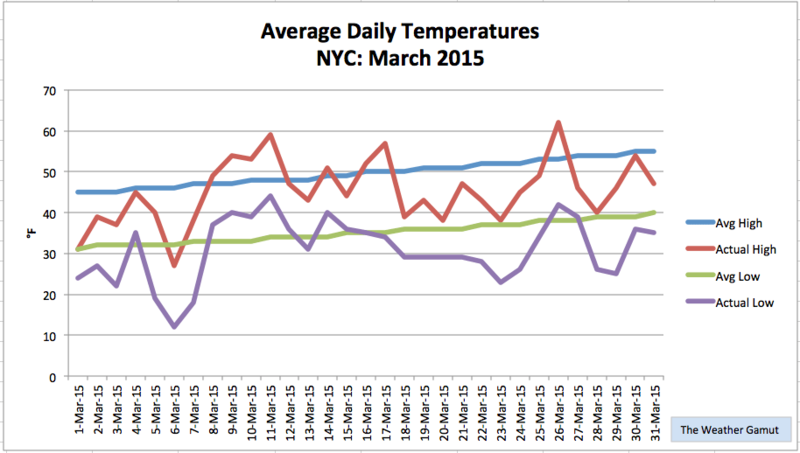 March 2015 was a bit of a weather rollercoaster in New York City. We had highs ranging from a chilly 27°F to a relatively balmy 62°F. In the end though, with 23 out of 31 days posting below average readings, the cold won out. The extended cold snaps helped lower the city’s mean temperature for the month to 38.1°F, which is 4.4°F below normal. That makes March 2015 the coldest March the city has seen in 31 years. In terms of precipitation, March 2015 was unusually snowy. In fact, according to the National Weather Service, it was NYC’s 6th snowiest March on record. The city measured 18.6 inches of snow in Central Park, which is a staggering 14.7 inches above average. We even had snow falling on the first day of spring. Rainfall was also abundant. The city received 4.72 inches, which is 0.36 inches above average for the month.